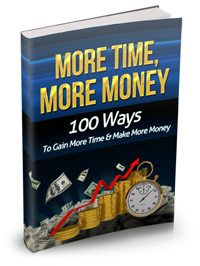 100 Ways to Gain More Time and More Money. Inside this eBook, you will discover the topics about 100 powerful ways to gain more time & make more money, Simple yet effective ways to make money online - even if you’re a newbie. These ideas will get you going on the fast track, How to automate and streamline your business so you don’t spend countless hours wasting time and so much more!